The question should have been simple, but when Ranya Idliby’s daughter came home from school and asked, “Do we celebrate Hanukkah or Christmas?” Ranya wasn’t sure how to answer. Ranya is a Muslim and was proud of her heritage, despite not being a regular worshiper at a mosque at the time. “How could I give my daughter an intelligent, clear answer that she could confidently deliver to other kindergartners?” she wondered. With a little study, she soon learned of the close connections between Islam, Judaism, and Christianity and decided that she’d like write a children’s book to share those connections. But first, she needed to find a Christian and a Jewish mother to collaborate with. She soon connected with Suzanne Oliver, a Christian, and Priscilla Warner, a Jew, and they started talking. Before long, the women’s conversations about what to write became conversations about faith itself and what each woman’s faith meant to her and how each viewed the others’ faiths. In one deeply uncomfortable early meeting, Priscilla became offended by Suzanne’s writing about the crucifixion of Jesus because, to her, the story was tainted by the anti-Semitic accusations that the Jewish people are the “Christ killers.” Suzanne didn’t see the story that way at all, and she was troubled that she might be asked to stay silent about an event that she considered central to her faith. (Ranya, meanwhile, feared that her concerns would stay forever on the sidelines.) Once this dispute was settled, another arose and then another. By this time, the book was on the back burner, and the Faith Club was going strong. The women committed to meet regularly and to come with a topic in mind to discuss. Their discussions got heated, as evidenced by some of the excerpts of the taped conversations that pepper the book. The women talked about the stereotypes each held about the others’ faith, they confronted one another about insensitive language, they debated their religious practice, and they wrangled over the ways politics and faith become intertwined. Yet through all the arguments, they forged a deep friendship. All three women share their stories in this book. Each chapter contains sections by each woman, so you learn something of what each was thinking at the time. That’s especially important in the chapters on the thorniest topics. And they made the smart decision not to just have each write a mini-essay on the topic and move on. The writing flows from one author to another, with each weighing in as needed, giving the book a conversational feeling, even though we’re reading about conversations that happened years ago. The writing itself is straightforward, warm, and friendly. I might quibble that the three voices sound the same and that there were a few too many references to what they were eating, but I don’t read this kind of book for the artful use of language. I read it for the chance to eavesdrop on others’ experiences. The Faith Club experience transformed all of these women’s lives. When they began meeting, only Suzanne, who was actively involved in a local Episcopal church, lived what most would consider a devout life. Ranya didn’t have a mosque at all, and Priscilla was filled with doubt about her faith. All had been raised in their respective faiths (although Suzanne was raised Roman Catholic), but they hadn’t done much intensive study of their beliefs. As they attempted to answer one another’s questions, they ended up learning more about their own faiths and becoming involved in their faith communities in new ways. As a Christian (and an Episcopalian at that), I could relate to some of Suzanne’s journey. Later in the book, she goes through a period of questioning some of her bedrock beliefs. How, for instance, could she continue to believe in a doctrine that teaches that Ranya and Priscilla wouldn’t go to heaven simply because they don’t believe Jesus is the son of God? Her priest notes that such questioning is not uncommon for those who participate in interfaith dialogue. It’s a complicated thing. It doesn’t seem right to abandon ideas you believe are true for the sake of keeping peace, yet some beliefs need to be abandoned because they’re wrong. Conversations like those the women in the Faith Club had force us to ask the hard questions that we may avoid because they shake up our supposedly unshakeable beliefs. The Faith Club is not unlike seminary in that respect. I hold a lot of my beliefs more loosely because of seminary, but I hold a small number of essentials–like God is love and love God and neighbor—more tightly than ever. As interested as I am in faith issues, this is a book I probably wouldn’t have read had my church book group not chosen it. (We’ll be discussing it next week.) My preferences lean more toward books like Abraham’s Children, in which the authors are theologians and activists who bring their expert voices and experiences to the conversation. But faith isn’t just for the experts; it’s for ordinary people, too. And a lot of this book’s value comes from the fact that these are three ordinary believers, grappling with the big questions. I read this last year when I was briefly in a book club. I found parts of it really fascinating, but got bogged down in some of the personal details. Even though with a story like this you do need personal details…I just felt that sometimes they got a bit defensive, or a bit too woe is me-ish. I know what you mean about the personal stuff. It mostly only bothered me when they went on and on about the jasmine tea and the hot chocolate. Thanks so much for the full references and the background work. I’m going to get around to reading the book, and then I’ll have a look at what you have to say. I’m sure the exploration will be worthwhile. I’m so glad to hear about this book, thanks! It is firmly on my mental tbr list. 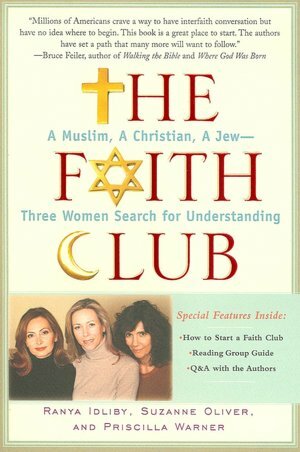 I liked this book, but I was bothered by how little the women knew about their own faiths – and in some cases, how tightly they clung to false notions about their faith. I feel like so many people stop after they’ve done the catechism (or its equivalent) – usually a stage of very concrete and un-nuanced beliefs – and then fight to the death over things better theologians resolved centuries ago. But I really liked the human interactions and the growth they all experienced. That bothered me too, but I liked how being part of this conversation forced them to get beyond that shallow starting point. I felt like at the end they were still on a journey and had a ways to go in some areas, but it seemed like they were genuinely grappling with their beliefs, which, as you say, a lot of people never do. My book group wants to discuss this book; however the study questions seem more appropriate for conversation about the entire book. We meet weekly and usually discuss a couple chapters each time. Can this book lend itself to that format? Any ideas? Thanks. That’s a good question! My book group used to meet weekly, but we switched to monthly just before reading this. Our discussion of it ended up focusing on the idea of a faith club and interfaith discussion in general, and I don’t think we could have kept that up over several weeks. However, I think it might work to discuss the actual topics the women talked about in their meetings. In fact, that could be pretty interesting!